This week is the 100th anniversary of poet Dylan Thomas’ birth. This reminded me of how his poem “A Child’s Christmas in Wales” warmed my Christmas season for many years, Often after the family was in bed I would play a recording of Thomas reading the poem and my imagination would take me to the Welsh country side where I could eavesdrop on a family at Christmas. Since I was a kid in boarding school my imagination has kept me company when I was lonesome or bored. I have listened to James Joyce’s Molly Bloom as she lay awake with a myriad of thoughts running through her mind. I mourned the loss of Manolete with the people of Spain when I listened to Lorca’s poem about his death. Carl Sandburg took me to the Chicago of my youth and I was grateful. I am so fortunate that my imagination has stayed with me all these years. These days whenever I am in my car or working out I listen to an audio book that takes me to another place and another time. I always have my Kindle with me so as I wait the book I am reading takes me to somewhere special. I have benefited personally and professionally because of my imagination and for that I am grateful. Here are excerpts from an article by Donald Louis Hamilton that I found interesting, I hope you will too. 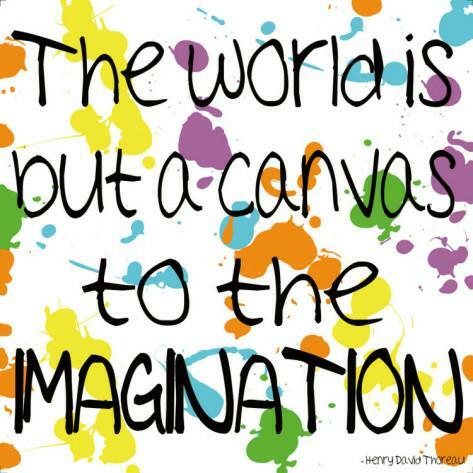 Develop a Powerful Creative Imagination! It can be your key to success. Being human – we all have been given the potential to develop a powerful ‘creative imagination’ to use for our benefit and possibly the benefit of all mankind. Everything mankind has achieved throughout its existence is a result of its “human imagination”. Human imagination is the “Special 7th Sense” that gives people the power to become aware of much more then our animal senses allows. We all know about our other senses such as; sight, hearing, smell, taste, balance that our brain depends on for its contact with the outside world. Here are some tips that can help you develop a strong creative imagination. Be curious about everything – the world is full of amazing wonders for you to learn about. They will become your storehouse of memories and ideas that you can use when needed. Look deep into the problem you face and imagine different alternatives for solving the problem. Try new paths – don’t accept the status-quo, if you fail at one task try another approach. Take everything with a grain of salt, keep an open mind. Try to associate with other creative people, people who discuss ideas rather then people who just talk about other people. Start thinking about writing a story, think of a plot, think up characters for the story, take notes and expand the story over a period of time. Refine and change the story if you want to. Take your time, new ideas will pop out of your subconscious as you think about it. It is your creation you can do anything you want with it, use you imagination. Whether you are writing music or leading an army into battle keep your mind open for opportunities – new angles – different strategies – if one thing doesn’t work try another. Develop your interests and natural talents – follow these talents – be curious, learn as much as you can about subjects you are interested in and then improvise, develop, expand them. Follow different off beat paths. If they don’t work try another tack. Build upon the ideas of other people – improve and refine their ideas. This is a fundamental reason for human progress. It created the “MIND” of mankind (the ability of people to continually spread ideas among other people across time and place). This is the secret of Mankind’s ability to progress. Isaac Newton once said – “If I have been able to see further then others – it is because I stood on the shoulders of giants”. Human progress is a step by step process made possible by the “MIND of Mankind”. A: Three. One to change the lightbulb, one NOT to change the light bulb, and one to neither change nor not change the lightbulb. The most serious threat to democracy is the notion that it has already been achieved. If it tastes good, it’s probably not kosher. Please read why Mason needs us all. I got the following from Mason’s Great Grandfather today and since so many of you are keeping him i9n your prayers I wanted to make sure you knew what was going on. have been greatly appreciated, to say the least, and we hope you will continue to travel Mason’s road with him, he needs our prayers now more than ever. The update below from the immediate family describes where we are, the immediate future and the follow-on treatment. Mason will be undergoing surgery tomorrow to have his tumor removed, they are not sure how much they will be able to remove and will scrape organs as needed. The Chemo has not produced the results which the doctors were anticipating but feel the radiation treatment that he will receive down the road will bear most positive results. After the surgery Mason with be in the hospital for at least a week and from there (not sure of the time frame yet) he will have 2 more chemo treatments, these doses will be very intense and have some devastating side effects. Following the chemo. 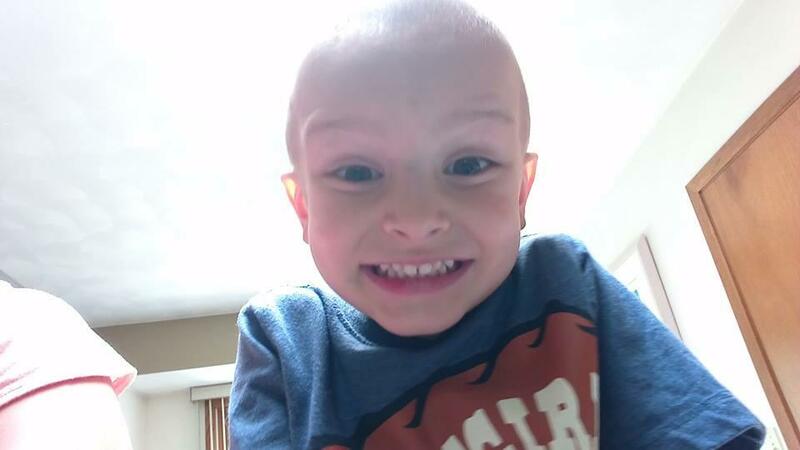 he will undergo an experimental radiation treatment which requires Mason to spend 3 days in a lead room, and from there more traditional radiation treatment will follow. You may recall Mason’s initial diagnosis was at Stage 4 Cancer. It is apparent that to overcome his monmouth challenge will require everything Modern Medicine can provide and a Miracle from God. Please continue your prayers with us and one day we can all rejoice in our realization of Mason’s Miracle. God Bless you for your prayers and please continue praying for Mason at this most critical point in his journey. I am sometimes told that I have a lot of problems that I don’t realize. I am told that I don’t pay enough attention to what is wrong around me. I am told I am overly optimistic. I am told I don’t recognize barriers and end up risking too much. I am told I am open with strangers. I am told that I don’t realize what is wrong with people who are not like us. I am told I don’t get angry enough. I am told I do more than I need to. I am told I care too much for people I barely know if I even know them at all. If these are all flaws than I agree I am guilty and I am glad that I am. I would much rather enjoy than to help to destroy. I would much rather do something than just sit back criticizing others for taking action. I hope you won’t mind if I just continue being me for I don’t much ever want to be what some others think I should be. Here is something I found in my files that I like, I hope you do too. I don’t know who Father Pat is but I wish I did. A driver pulled up beside a rundown farmhouse. He got out and knocked at the door. An elderly woman answered the door, and he asked her for directions to Des Moines. He got back in his car and pulled away. Then he heard voices. He looked in his rear view mirror and saw the woman and an equally old man waving for him to come back. So he made a U-turn and drove up to them. Two paramedics are sent to check on a 92-year-old man who has become disoriented. They decide to take him to the hospital for evaluation. While the paramedics are rushing him to the hospital with sirens blaring, one of them talks to the man to determine how aware he is. As you know I am a big believer in people’s ability to manage their lives if they are willing to work on what would really make them happy and then to do what is necessary to make the changes that will brighter their future. I know it is not always easy, sometimes even risky, but there is nothing you can do that is more worthwhile than making an investment in yourself. The first step is finding out what you really want and not just pretending that you already know. But I’ll tell you what; if you can make an objective evaluation of where you are now and where you would like to be you will have what you need to start working on a happier future. Here is an abridged piece from Mark Chernoff that can help. If I ask you, “Quickly, in one sentence, what do you want most out of life?” I bet your rushed response is going to be something like, “I want to be happy, and have a healthy family, and a career I like that pays well, etc.” Your response is going to be so common and ubiquitous that it basically doesn’t even mean anything. Which is precisely why senseless, happy-go-lucky questions like this aren’t very helpful. And yet, this is precisely the kind of questions we often ask ourselves. Based on my daily routines and actions, where can I expect to be in five years? – This question just backs up the first one. If you have an idea about what you want the next chapter of your life to look like, you have to DO things that support this idea every day. An idea, after all, isn’t going to do anything for you until you do something productive with it. In fact, as long as that great idea is just sitting around in your head it’s doing far more harm than good. What do I need to spend more or less time doing? – As Stephen Covey once said, “Most of us spend too much time on what is urgent and not enough time on what is important.” In other words, productivity is not just about getting things done, it’s about getting the right things done. At the end of each day, look at how you have spent your time, and adjust the allocation as necessary for tomorrow. .
What old rejections (or failures) are still holding me back? – All too often we let the rejections of our past dictate every move we make. We literally do not know ourselves to be any better than what some opinionated person or narrow circumstance once told us was true. Of course, an old rejection doesn’t mean we aren’t good enough; it just means some person or circumstance from our past failed to align with what we had to offer at the time. Don’t let old rejections take up permanent residence in your head. Kick them out on the street. What is worth smiling about right now? – A recent scientific study at Duke University showed that doctors who are put in a positive mood before making a diagnosis consistently experience significant boosts to their intellectual abilities than doctors in a neutral state, which allows them to make accurate diagnoses almost 20% faster. 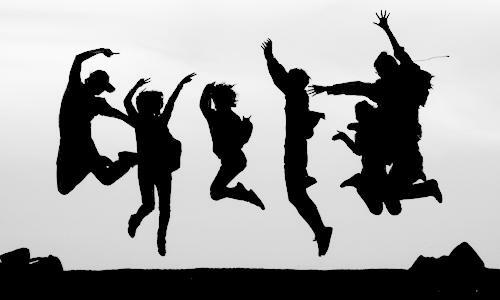 Students primed to feel happy before taking math tests substantially outperform their neutral peers. So it turns out that our minds are literally hardwired to perform at their best not when they are negative, or even neutral, but when they are positive. Are the people around me helping me or hurting me? – A big part of who you become in life has to do with who you choose to surround yourself with. And as you know, it is better to be alone than in bad company. You simply cannot expect to live a positive, fulfilling life if you surround yourself with negative people. Distancing yourself from these people is never easy, but it’s a lot harder when they happen to be close friends or family members. As hard as it may be, it’s something you need to address. A new convert to Catholicism decided to go to confession to deal with his transgression. In the confessional, he told the priest that he had sinned. “What was your sin, my son?” asked the priest. “I stole some lumber, Father,” replied the man. Paul was not the brightest guy around. Every day, when he walked home from work, he would get stopped by three nasty men and they would beat him up and steal his money. Finally, Paul decided that it would serve his best interest to walk a different route, but also take some self-defense classes so this wouldn’t happen again. He joined a karate class and soon was doing very well with it. So, one day, on the way home from work, Paul confidently decided to take his old route home and, sure enough, there they were. He walked up to them and the battle ensued. The next afternoon, Paul went to his karate class with a black eye, a broken nose and a busted lip. His instructor was shocked and asked for an explanation. The other day we talked about how so many of the people I meet don’t realize how good they are. In my world almost everyone I meet are special in some way. In fact some just take their unique talents for granted because they have confidence in themselves and what they do. Some folks just seem to have natural talent while others develop their skills over time. The good news is that each of us can continue to develop ourselves as time goes by. The very best people I know started simply but then grew to personal greatness by always striving to do better. In fact when someone commits to doing their best every day walking the path to greatness becomes easy and natural. 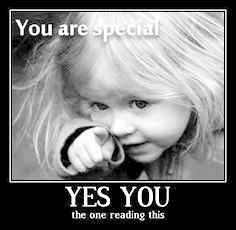 I know you are already special but you may have more in you. Here is an article for those of us who want to continue our development. One of the things that badly affects self confidence are the comparisons people always make between themselves and others. That’s why one of the best things you can do to feel more confident is to implement a belief that helps you stop these comparisons. What belief could be better than convincing yourself that you are unique and special? If you managed to feel unique and special then these comparisons will stop and you will become more confident, that’s why i will tell you exactly what you need to do in order to feel special. Dare to be different: Do the things that you like with disregard to criticism, dare to have your own taste, style and make sure you let the world know that you are different. After all if you became like everyone else then how would you feel special? Do what people fear to do: Dare to take risks, to do the things that others fear doing and to step out of your comfort zone. That would make you feel unique and special. Don’t get me wrong by doing something foolish just to be different. For example if everyone goes to school or college then don’t decide not to go just to be different or special. Its all about being different in a good way that makes you feel special. For example if everybody is stuck in the rat race then it might be a good idea to be self-employed (just an example, i am not asking you to do that). You will never be able to feel confident before you feel that you are unique and special. FROM HERE TO MATERNITY — OH HOW WE CHANGE. Second baby: heated cow’s milk poured from a carton. First baby: boiled 10 minutes, removed with tongs and rubber gloves. As soon as you have one, a better one is just around the corner. As soon as you make a commitment to one, you find yourself spending half your pay on accessories for it. The doctor came out of the operating room to talk with the man’s wife. “I don’t like the looks of your husband,” he said. If a man is bald in front, he’s a thinker. If he’s bald in the back, he is a lover. If he’s bald in front and back, he thinks he’s a lover. Last Friday I was given the opportunity to attend a banquet celebrating the OASIS of Central Indiana’s 25th anniversary. My town’s OASIS chapter is a great organization made up of more than 25,000 over fifty year olds who take advantage of offerings that help them stay healthy and active, continue lifelong learning, develop new skills, join with others to travel to interesting locations and more. For me the best thing they do is train volunteers who go out and do great things for our community. There are OASIS volunteers tutoring and nurturing hundreds of kids every day, kids who benefit from adult love. They are also teaching young children to enjoy making healthy choices and are helping older folks learn how they can avoid diabetes. They do all this while providing the people power that makes OASIS as strong as it is. I became active with OASIS a number of years ago and it was one of the best things I ever did. They have not only allowed me to benefit from their programs, they also have let me assist in their continued growth through helping to build new partnerships while implementing plans to stay current meeting the needs of those who have reached their prime. Anyway back to the banquet, it was great. Good food, good fellowship and great entertainment by two professional Musical Comedy stars from the Actors Theatre of Indiana (ATI). I was a little taken back when Cindy Collins from ATI included me in her rendition of one of Sinatra’s favorite songs, once I recovered from the surprise I was the same old guy I was when she started. The following is the philosophy of Charles Schulz, the creator of the “Peanuts” comic strip. You don’t have to actually answer the questions. Just read the e-mail straight through, and you’ll get the point. Psychiatrists say that 1 of 4 people is mentally ill. Check three friends. If they’re okay, you’re it. It may be your sole purpose in life is simply to serve as a warning to others. The Lord replies, “As you wish,” and the light retracts back into the heavens. I hope you are as happy as he is. As I sat with friends yesterday I complimented one of them on his lifestyle choices. You see my friend works nights for Federal Express on a labor intensive job that provides him a reasonable income and benefits. He was a senior corporate executive in the past; you know one of those jobs filled by people who covet the medals awarded to folks for doing what they don’t like to do. My friend decided, like Henry David Thoreau, that he preferred his own version of Walden Pond. He now spends his days doing humanitarian work, having fun with grandchildren and doing things meaningful to him. Others may not see how successful in life he really is but I do. His wealth is in his self-satisfaction and my community wins because of his choices. 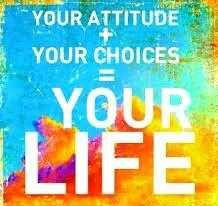 It is our CHOICES that show what we truly are, far more than our abilities. You know this is true. So… I want to ask you a simple question: Are you happy? If you answered “no,” then I want to ask you another question: Do you feel you deserve happiness? Heartache can get the better of us. Struggles—with our work, in our family, in pursuit of our dreams—can weigh us down and trick us into thinking that we aren’t worthy of true happiness. Happiness is a course of action, a way of being, a mindset as well as a method. 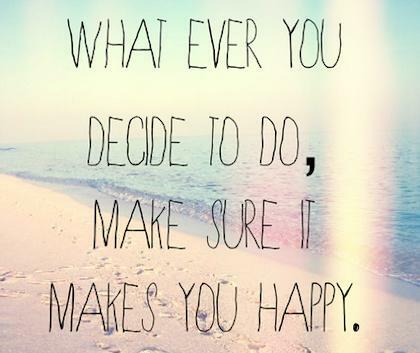 True happiness results from the ongoing commitment to making positive choices. These choices need not be complicated. Here are two simple changes you can begin today. We all make mistakes. It’s part of being human. In the wake of such mistakes, however, there’s a shocking difference between how we treat ourselves versus how we treat those we love. The next time you make a mistake, I want you to listen to the way you talk to yourself. What words do you use? Does any of it sound like this? “You are so stupid! What were you thinking? You screw this up every time!” This is the clean version; I know many of us use harsher words—even profanity—with ourselves. Now picture a person whom you love dearly—your spouse, your mother, perhaps your best friend. If she came to you and admitted to making a mistake, what language would you use? Would your words be ones of anger, or would they be words of kindness? Research by positive psychologists has found a clear link between gratitude and happiness. People who take time each day to express gratitude live happier lives—but in the busyness of our day, it can be easy to forget to take the time. Here’s a great trick that will help you remember to make gratitude a daily practice: do it while you brush your teeth.It sounds silly, I know—but it works. As you pick up your toothbrush, say to yourself, “Today, I feel grateful for…” and as you brush, think of as many things as you can. Nothing is too simple to make the list. The longer you practice expressing gratitude, the faster examples will pop into your mind. And as a bonus, you’ll spend more time brushing your teeth!